Part 2. 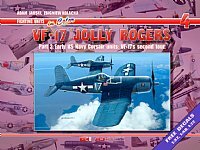 Early U.S. Navy Corsair Units: VF-17's second tour - COMING SOON! 210 × 280 mm (landscape), 48 pages + cover, 122 b&w photos, 29 colour photos, 2 colour plates, 1 sheet of decals; 2012, ISBN 978-83-7237-229-1. 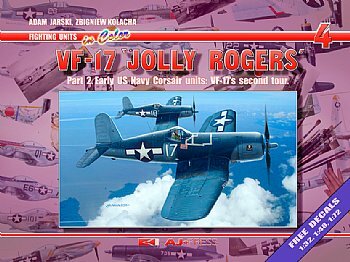 This book was published as part of the 'war' against what is probably the most permanent myth of the US Navy aviation: the myth of red outlines on US national markings of VF-17 aircraft during the first (October - November 1943) and second (January - February 1944) tours of operations. The problem is that not a single color photo of the unit's aircraft from the period has surfaced so far, although it seems that the US Navy propaganda unit, which had color film, has visited it at least twice. But it is possible to dispel it just by analyzing black and white photos of the unit's Corsairs, especially at the time of Panama Canal passage, when many photographs were taken of VF-17 machines carried as 'deck cargo'. With broad comparative material in form of original color photos of aircraft from the same period, where the outline is blue, clearly paler than the star disc (!) one comes to the conclusion that previous interpreters of black and white photos of VF-17 aircraft, wherever the outline was paler than the star disc, have always assumed it was red. It is not clear what was the basis for that, although we ourselves tended to believe that, too. Having analyzed the available photographic material and documents from that period we now consider this out of question for aircraft in South Pacific front line area already as early as August 1943. The introduction of read outline by Army-Navy Specification AN-I-9a on 29 June 1943 has caused a veritable storm among South Pacific area commanders. The first to protest was Gen. Kenney, commanding the 5th AF, who refused to introduce the red outline. He consulted the matter with the commander of the 13th AF. They only ordered adding the white bars on their aircraft. In the NAVY the storm was started by the area supreme commander, Admiral William 'Bull' who, when he received the long awaited reinforcements in form of two air groups on the aircraft carriers USS 'Yorktown' CV-10 and 'Lexington' CV-16 in July 1943 with all their aircraft sporting red outlined markings, ordered removal of these outlines by his directive 300224 of 31 July 1943. Overpainting any trace of red from US Navy aircraft following the Battle of the Coral Sea, with prominent support of this admiral, had not been done to bring the color back a few months later! The red areas, in form of red discs inside the white start and of red stripes on the rudder, strongly confused AA gunners who fired at anything that showed a trace of red. That was why Adm. Halsey issued his famous orders to remove the red outlines. That was where a series of misunderstandings and confusion commenced. The matter is discussed broadly in this book, which includes a lot of evidence against existence of any such red outlines on VF-17 machines during combat operations. The matter is further confused by 'researchers' of the subject, who have dealt with the subject of color used in camouflage and markings. For them only one specification exists: the Army-Navy Specification AN-I-9b of 14 August 1943 which apparently defines the outline color as Insignia Blue. If that was so, why did the outline continue to be seen as paler for another few months after the document was issued? And what was the purpose of the AN-I-9b correction of 24 September where Insignia Blue was expressly defined as the correct color of the outline? It seems that a lot of light would have been shed on the matter if the original form of the document dated 14 August was found. Existing publications fail to quote the date of issue of the document they used. We hope that this book will serve as a catalyst to start proper research of the subject.